In addition to the Kawasaki Ninja 250 2018, one of the other bikes awaited by lovers of the manufacturer is attached to the green color is the figure of an entry-level retro motor that is gossip has surfaced since a few months ago. And the figure was as expected, named Kawasaki W175. Yep, once again PT Kawasaki Motor Indonesia (KMI) did triple forest to open a new market segment. Through Deputy Head Sales Promotion Dept. PT KMI, Michael C. Tanadhi, KMI party feel quite confident with the presence of Kawasaki W175 as a pioneer in the entry level retro motor market in Indonesia. In fact, the motor that carries the theme "Lead do not Follow" itself is pegged to 1,000 units per month, which in total will contribute 12,000 units of sales per year to KMI. The presence of Kawasaki W175 is also quite special, because this bike gives effect to Kawasaki Estrella 250 which changed its name to Kawasaki W250. 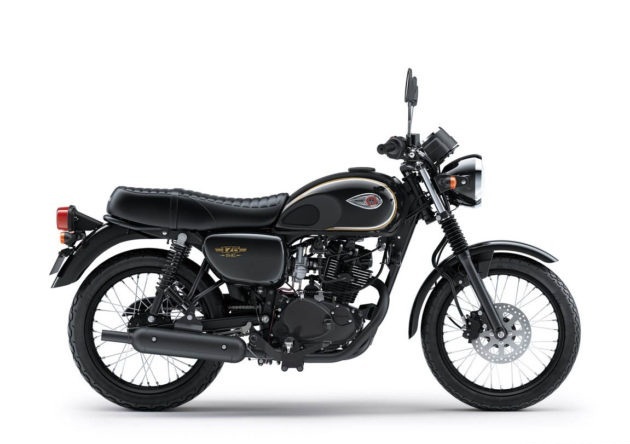 The model is positioned as the successor of Binter Merzy itself carries the mask of Kawasaki EL175 aka Kawasaki Eliminator 175, a cruiser-style motor sold in India there. And because the base is the same as the Kawasaki EL175, the machine that was carried was similar to the model. Kawasaki W175 uses a carburetor engine with a carburetor, yes, carburetor with a capacity of 177cc engine, four not with one cylinder. Kawasaki W175 car karbu engine has a compression 9.1: 1, which means that compression can still drink Gasoline with 88 octane like Premium. Power from SOHC Kawasaki W175 own machine to touch the number 13 PS at 7,500 rpm with maximum tosi at 13.2 Nm at 6,000 rpm. Kawasaki W175 itself has a body weight of 126 kg, which means not too heavy with a length of 1.9 meters, 765 mm wide, and also 1 meter high. Kawasaki W175 comes with a tank capacity of 13.5 liters which will be supported by the framework of the double cradle model. For suspension, the Kawasaki W175 relies on a 30mm telescopic telescopic model on the front side that looks cute, and dual shock on the back side. The legs of the Kawasaki W175 are also sufficient with the 80/100 tire profile on the front side and 100/90 on the back side. 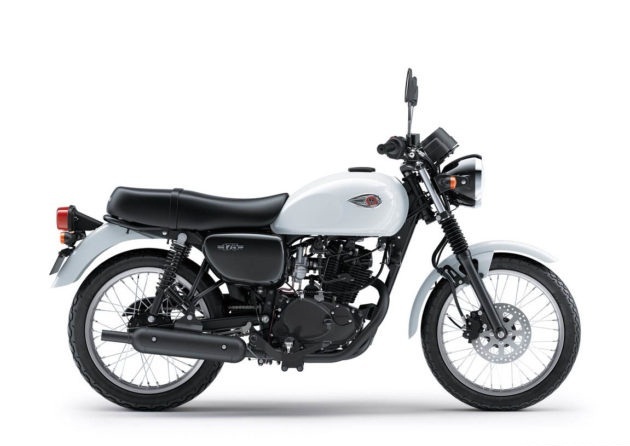 Kawasaki W175 itself comes with two choices of variants, the standard variant comes with white only, and variant of SE aka special edition with three color choices of interest, especially black color. For SE variants have Metallic Spark Black colors, New Silver and Metallic Matte Covert Green. The price of the Kawasaki W175 for the Jakarta area is 29.8 million rupiah, and for the SE variant is 30.8 million Rupiah, quite interesting. 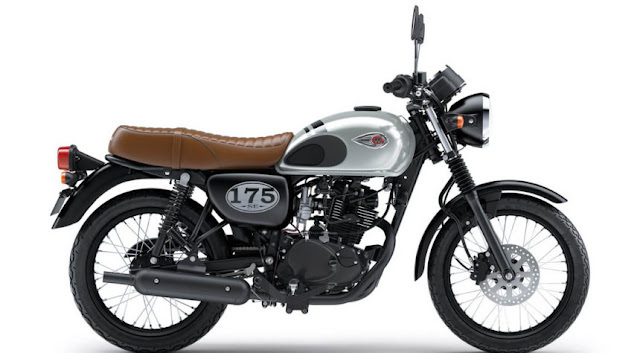 For the SE variant itself will get chrome - bolt - bolt, and feet - feet using dark-colored aluminum alloy wheels and also seats with similar motifs owned Kawasaki W800. In addition, the Kawasaki W175 SE emblem is also present on the side of the motor. Surely the presence of this Kawasaki W175 makes it an attractive choice for modern retro motor enthusiasts who are mushrooming in recent years. What do you think? Come to your opinion buddy. 0 Response to "Kawasaki Released W175, Retro Motorcycle that uses Carburetor"